Those expecting General Motors to jump through the hoop in launching the company down the compacted graphite iron (CGI) route with its redesigned Duramax 6.6L V-8 turbo-diesel will go to bed tonight disappointed. And others might see a step from piezo as a backwards move. Instead, managers and engineers have remained firmly rooted in tradition with, as in previous versions, the “new” Duramax featuring a block with a strong cast-iron foundation known for its durability, but with induction-hardened cylinder walls and five nodular iron main bearings. It retains the same 4.05-inch (103mm) and 3.89-inch (99mm) bore and stroke dimensions as the current engine, retaining the Duramax’s familiar 6.6L (403 cu.-in./6,599 cc) displacement. Along with a 19 percent increase in max torque over the current Duramax 6.6L, the redesigned turbo-diesel’s performance is quieter and smoother, for greater refinement. In fact, engine noise at idle is reduced 38 per cent. The choice of "more of the same" can be seen in the comments of senior management. On the basis of this, if it ain’t broke, don’t fix it. The new Duramax 6.6L shares essentially only the bore and stroke dimensions of the current engine and incorporates a new, GM-developed control system. The Duramax’s signature low-rpm torque production has not changed and still offers 90 per cent of peak torque at a low 1,550 rpm and sustains it through 2,850 rev/min. What does new really mean? Sometimes it really is hard to understand what the word “new” really means in the minds of some people. And GM claims among the engine’s highlights: New, stronger cylinder block and cylinder heads; New, stronger rotating and reciprocating assembly; Increased oil- and coolant-flow capacity; New EGR system with single cooler and integrated bypass; New electrically actuated/electronically controlled turbocharging system; All-new advanced solenoid fuel system; All-new electronic controls; New full-length damped steel oil pan that contributes to quietness; New rocker cover/fuel system acoustical treatments and B20 bio-diesel compatibility. So, it must be new! According to GM, a deep-skirt design and four-bolt, cross-bolted main caps help ensure the block’s strength and enable more accurate location of the rotating assembly. A die-cast aluminum lower crankcase also strengthens the engine block and serves as the lower engine cover, while reducing its overall weight. The connecting rods are stronger, too, says GM. They incorporate a new 45-degree split-angle design to allow the larger-diameter rod bearings to pass through the cylinder bores during engine assembly. That’s been a long time coming! They rods forged and sintered with a durable powdered metal alloy, with a fractured-cap design enabling more precise cap-to-rod fitment. The redesigned engine retains the Duramax’s signature “first-in-class” aluminum cylinder head design, with six head bolts per cylinder and four valves per cylinder. The aluminum construction helps reduce the engine’s overall weight, while the six-bolt design provides exceptional head-clamping strength — a must in a high-compression, turbocharged application. The Duramax employs a common-rail direct injection fuel system with “new high-capability solenoid-type injectors. High fuel pressure of 29,000 psi (2,000 bar) promotes excellent fuel atomization for a cleaner burn that promotes reduced particulate emissions. The new injectors, says GM, also support up to seven fuel delivery events per combustion event, contributing to lower noise, greater efficiency, and lower emissions. But nothing new in that! It adds that “technology advancements” enable less-complex solenoid injectors to deliver comparable performance to piezo-type injectors. Finally, GM adds that “new” electronically controlled, variable-vane turbocharger advances the Duramax’s legacy of variable-geometry boosting. Compared to the current engine, the system produces higher maximum boost pressure — 28 psi (195 kPa) — to help the engine make more power, and revisions to enhance the capability of the exhaust-brake system. Taken as a whole, there is nothing here to make the ground move. Ford engineers at Dearborn will not be too worried. Better luck next time GM. Meanwhile, those expecting GM to dip its toes into the CGI pool will have to wait for the next engine launch. Or maybe even the one after that! Strange way to go if they want to lead the development. 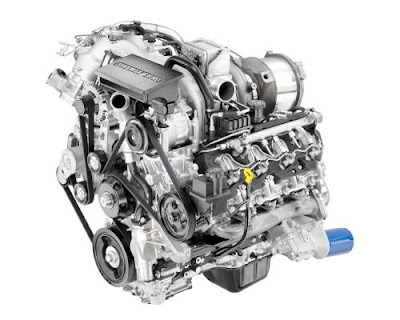 At present, there are only two V-diesel engines in the market that are not based on CGI cylinder blocks: the Mercedes 3.0L V6 (aluminium) and the General Motors 6.6L Duramax V8 (grey cast iron). CGI has effectively become the standard material for V-diesel engine cylinder blocks. It seems close to a switch to CGI. GM is now announcing that the Defiance foundry will totally stop making grey iron blocks. Duramax is as far I can see the only engine that is poured there. “To upgrade the equipment would have been cost prohibitive,” he said. "CGI has effectively become the standard material for V-diesel engine cylinder blocks." If GM were intending to continue with grey iron they wouldn´t close the greyiron in Defiance.